PETALING JAYA: A new record for property prices in the heart of Kuala Lumpur is close to being set after two penthouses of the world-class Four Seasons Place were reserved at a whopping RM37mil each, sources said. 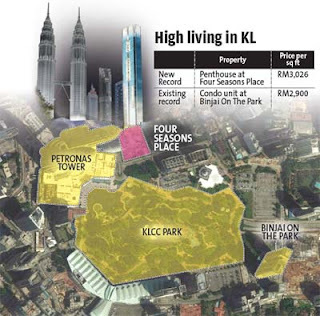 This works out to a princely price of RM3,026 per sq ft based on the 11,900 per sq ft size of each penthouse, outpacing the RM2,900 per sq fe record held by The Binjai On The Park based on a transaction last year involving 4,000 sq ft in Tower A of the development. However, the Binjai project would still hold the record for the highest absolute price transacted for a residential property at RM38mil for one of its triplex penthouses sold in 2010. The size of that Binjai penthouse was, incidentally, 14,300 sq ft, giving it a price of RM2,660 per sq ft. The buyers of the two Four Seasons Place penthouses had reserved the units “a few years ago”, when the project was in its planning stage, the sources told StarBiz. They added that when the project was launched by Prime Minister Datuk Seri Najib Tun Razak in early February, the same buyers had quickly reaffirmed their seriousness in purchasing the penthouses. The Four Seasons Place is being developed by Venus Assets Sdn Bhd, with a gross development value of some RM2.8bil. It is a joint venture between tycoon Datuk Ong Beng Seng, the Sultan of Selangor, Tan Sri Syed Yusof Syed Nasir and Venus Assets director Datuk David Ban. Venus Assets bought the prime 1.05ha site for RM90mil in 2003 from the estate of the late Khoo Teck Puat, the former major shareholder of Standard Chartered plc. The sales office of the Four Seasons Place is in the process of securing the booking and down payment for these units. The company had yet to respond to StarBiz's queries as at press time. Situated side-by-side on the 63rd and 64th floors, the penthouses are shell units, the property lingo for units minus any developer-built fixtures. The sources said that one of the eight duplexes in the Four Seasons Place had been sold at RM2,750 per sq ft at an absolute price of RM20.3mil. The remaining seven duplexes have all been reserved. There are 65 storeys in the Four Seasons Place, with a “height premium” of RM25,000 to RM30,000 for every floor going up. “Some 50% of the 242 residential units of the Four Seasons Place have been booked. They payments are coming in now, with 20% of down payments having been collected so far. It would be open to the public for sale from the third week of April,” revealed the sources. The sources added that surprisingly, most of the buyers were well-heeled Malaysians. The smattering of foreign buyers included Japanese, Hong Kong nationals and Taiwanese. The Four Seasons Place in Kuala Lumpur is the first Four Seasons Place in South-East Asia. It consists of 11 storeys of hotel space, beginning from the eighth floor to the 18th floor. It also has five floors of retail outlets, three floors of serviced apartments, three floors of private carpark and four basement storeys. A 65-storey luxury hotel, residential and retail project in the vicinity of the Petronas Twin Towers in Kuala Lumpur City Centre, it will house the 231-room Four Seasons Hotel, 242 units of private residences and 300,000 sq ft of upscale retail space. GEORGE TOWN: Eastern & Oriental Bhd (E&O) has completely sold all the 73 landed properties in the RM260.6mil Villas By-The-Sea project. The first batch of 40 two- to three-storey detached villas were sold and delivered to the purchasers in 2009, while the second batch of 33 units of three-storey detached and three-storey super-semi-detached villas were recently completed and delivered. The project was a collaboration between E&O, CIMB-Mapletree Management Sdn Bhd (CIMB-Mapletree) and the Al Salam Bank of Bahrain, the parties who had signed an agreement in 2006 to jointly-develop the villas. A private event was held in Penang to mark the culmination of this successful collaboration. E&O was represented by deputy managing director Eric Chan Kok Leong, while the other two parties were represented by CIMB-Mapletree chief executive officer Raja Noorma Raja Othman and Al-Salam Bank chief executive officer Yousif Taqi. Chan said in a press release that the group's aim was to fulfil lifestyle aspirations and was grateful to its partners CIMB-Mapletree and Al-Salam for their confidence and trust in E&O. Raja Noorma Othman said the secret to a successful joint venture lay in the insightful selection of players who would bring together a unique congruence and synergy of shared objectives and complementary capabilities. “Leveraging on CIMB-Mapletree's unrivalled network and reach, we were able to bring together two other highly respected entities in Al Salam Bank and E&O to strike a tripartite partnership that delivers an award-winning end-product with an innovative and cross-border structure. We aim to emulate similar successes for our subsequent funds,” she added. Yousif, meanwhile, said the joint venture with E&O and CIMB-Mapletree had been a very fruitful one for all parties. “We couldn't have asked for better partners to collaborate with in Malaysia. The trust in the partnership was apparent from the start and grew from strength to strength,” said Yousif. The 73 villas enjoy an excellent location in the world-class master Seri Tanjung Pinang development, which is one of Penang's most sought-after residential enclaves, a preferred address among locals and home to more than 20 nationalities of foreigners.